Hello! 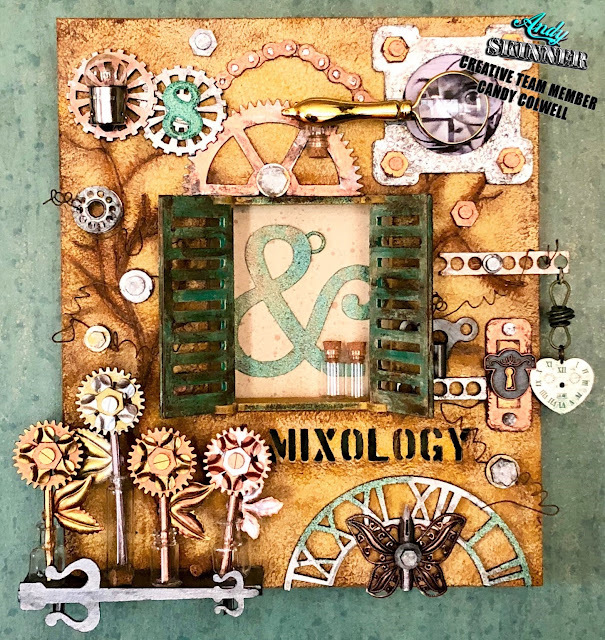 It's Candy and this month I'm delighted to share my Mixed Up Mixology Frame using Andy's Ministry of Mixology Kit. I totally LOVE this kit! So much comes in it and I added a few of my own metal elements from my stash. I wanted to bring a little bit of shabby chic into this otherwise industrial style kit. Don't get me wrong. I love industrial. But I also love vintage and shabby chic and like to insert it into my pieces when I can. So, I hope you can get the vibes as you look at this wall decor piece. The shutters are off the charts genius! They actually are attached so that they can open and close. Anytime I can have interactive pieces on in my art, I am thrilled! It adds so much more to the dimension, texture and just FUN of a piece. It makes you just want to touch it and play with it. 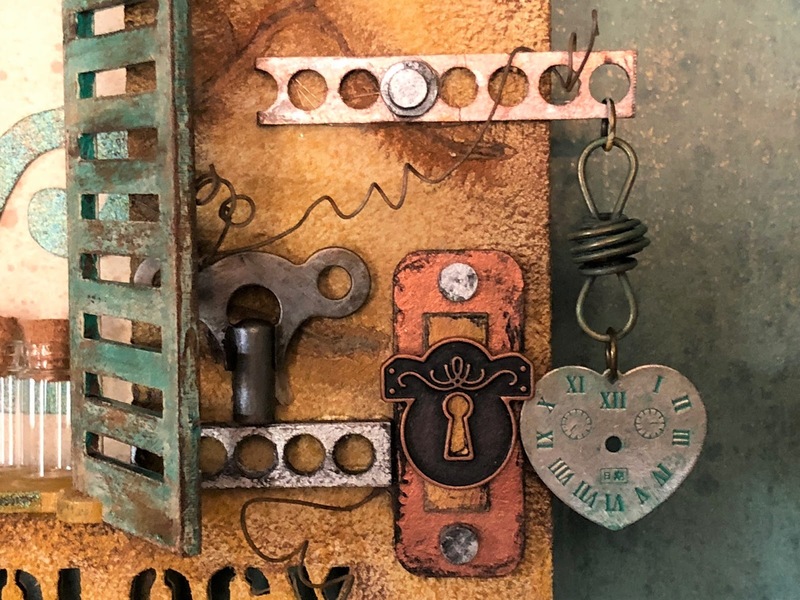 Let's explore how this all came together because I think you would have so much fun making one of these as a wall decor piece or even as a fabulous frame for a photograph! Here is how this project began ... very simple and straightforward. There are a lot more pieces that come with this kit but I was trying to possibly place some of the larger pieces first and get a feel for a design. This kit is made from a pressed hard board and very sturdy grey board laser cut pieces...tons of them! First thing I did was create a little 3D shelf using a couple of pieces of scrap chipboard cut into 1" x 4" pieces. 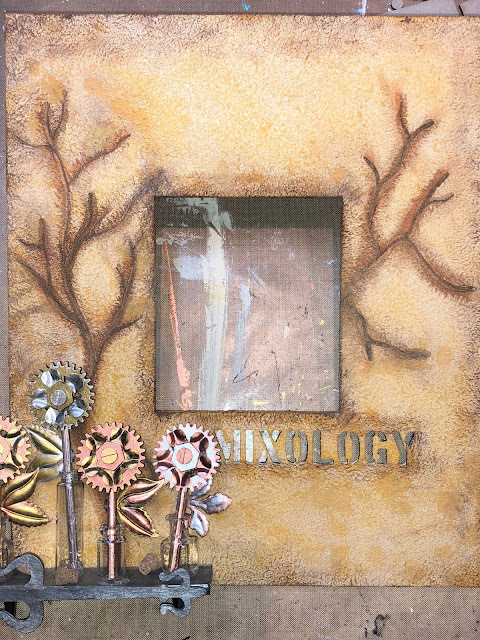 They were glued together and painted first with DecoArt Media Fluid Acrylics Metallic Silver followed by light sweeps of Carbon Black to tone down the silver. 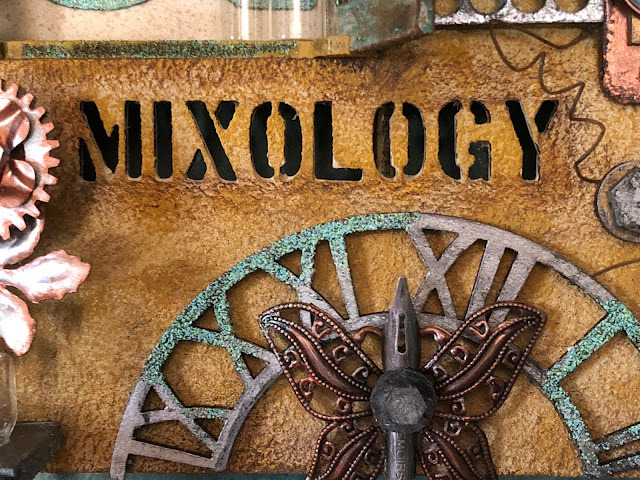 Next I used one of Tando Creative's Clock Hands to create a unique design on the front of the shelf. I painted it in the same colors and glued it to the front of the shelf. I used two metallic corner pieces underneath the shelf to help brace it in place. So ... what is going to sit on the shelf? 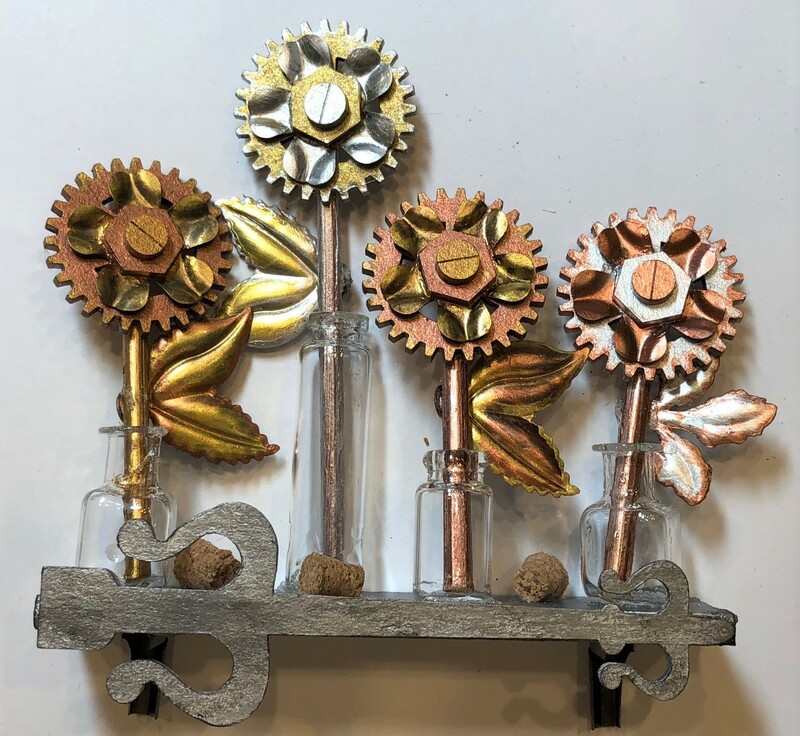 How about some shabby chic industrial flowers? I picked out four various size little glass vials that would stagger on the shelf. 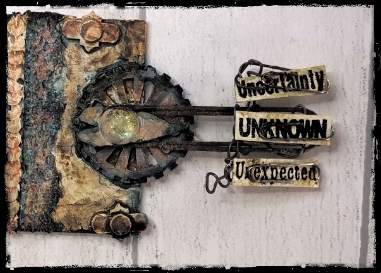 Next I painted a little wooden skewer with DecoArt Dazzling Metallics Worn Penny. You will see some metallic flower petals and leaves mixed in with some grey board gears and screw tops from this Mixology Kit. I painted all of the pieces separately and then glued them together. Most of the painting of these I did with my fingers because I totally love the feel of actually touching the elements as I am coloring them. I can also control how much randomness of color and shading I want on each peace as I am working with my fingers. You will see the base colors vary as to the contrasting colors on the finished flowers when they are put together. 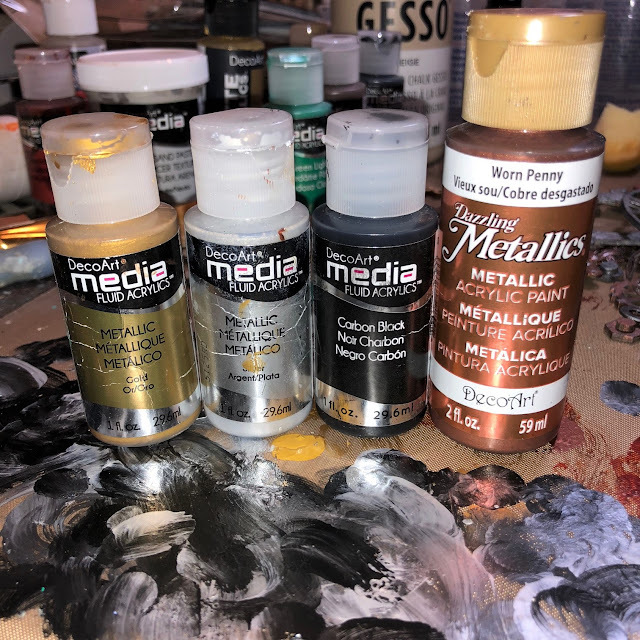 The colors I used to create my little shelf garden are DecoArt Media Fluid Acrylics Metallic Gold, Metallic Silver and Carbon Black mixed with the DecoArt Dazzling Metallics Worn Penny. 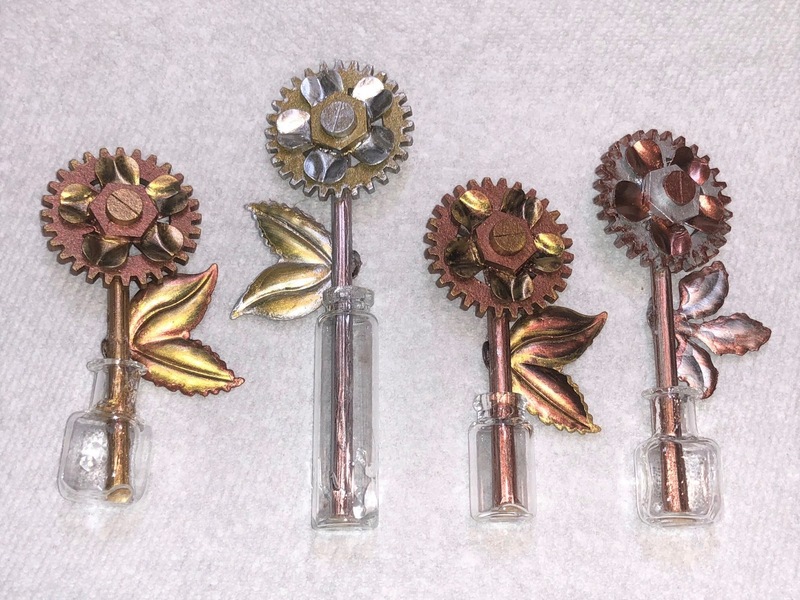 I glued all of the vials in place along with the cork tops from the vials. I love how this little shelf turned out. 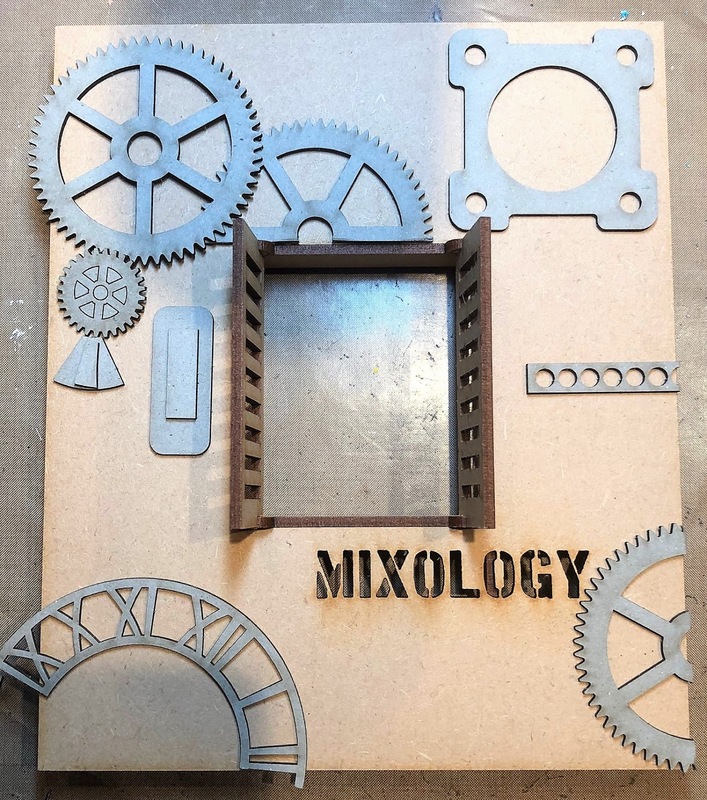 Here are the other pieces that I used on the Mixology frame. Almost all of these were from this kit except for the Andy Skinner Bike Chain and the metal pieces I used to embellish. All of these pieces were pretty much painted using my fingers and with the same colors mentioned above. Now for the actual frame base. 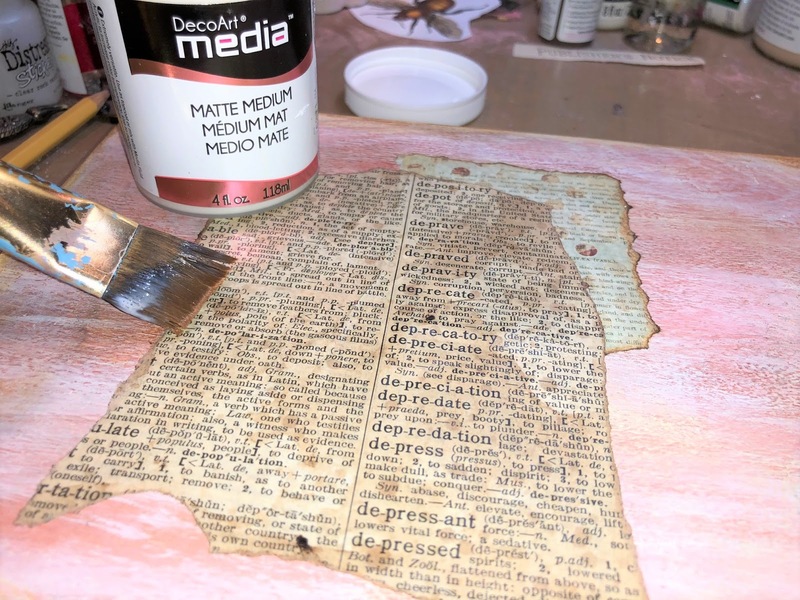 I began by giving it a coat of DecoArt's NEW Chalky Gesso in Beige. 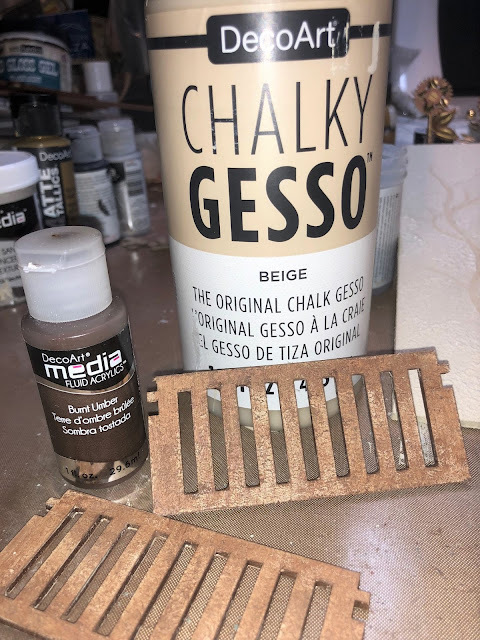 I am in love with this new product and use it a lot as a base coat. It flows on so smoothly and gives the base a nice chalky finished feeling. No need to sand or have a lot of brush strokes showing with this! It comes in a variety of colors but the beige was a perfect base coat for my frame. 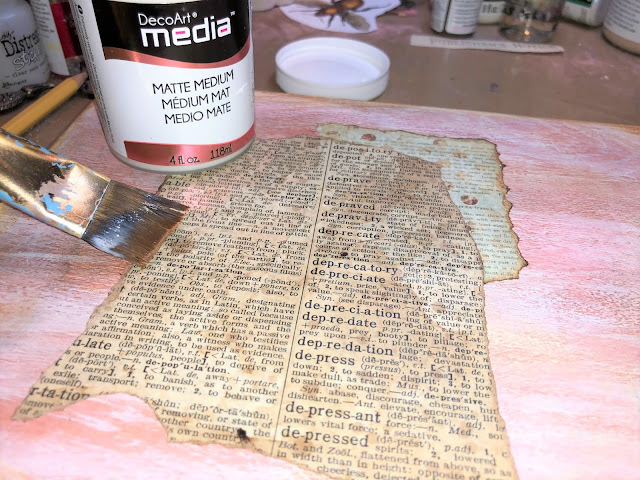 Next I mixed more of the DecoArt Chalky Gesso in Beige with DecoArt Media Texture Sand Paste. It worked beautifully! I used a small piece of a sponge and pounced the mixture all over the frame. I kept layering more texture and grittiness by pouncing with the sponge. This gave my frame a gritty, stucco look that I was going for. 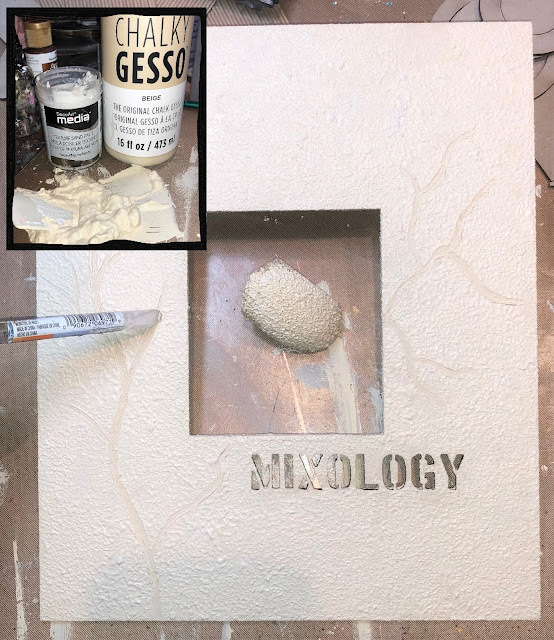 I used the sharp end of my paint brush and added crack lines into the wet Gesso/Texture Sand mix. I heat set it to dry. 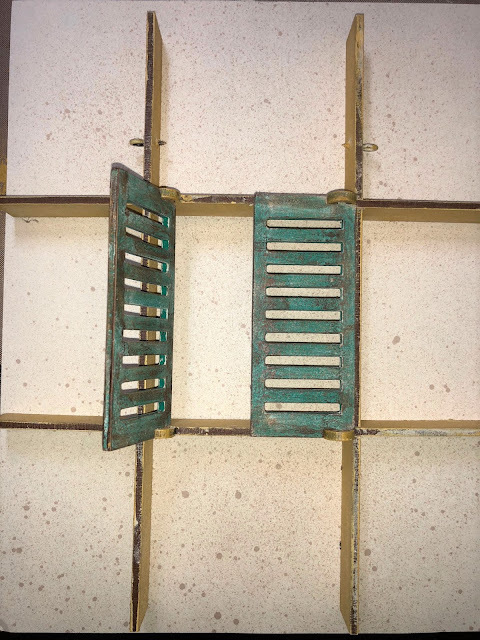 I base coated the shutters with a light coat of the DecoArt Chalky Gesso in beige and then lightly brushed over them with DecoArt Media Fluid Acrylics Burnt Umber. Using my fingers, I wiped on a layer of DecoArt Media Fluid Acrylics Blue Green Light. 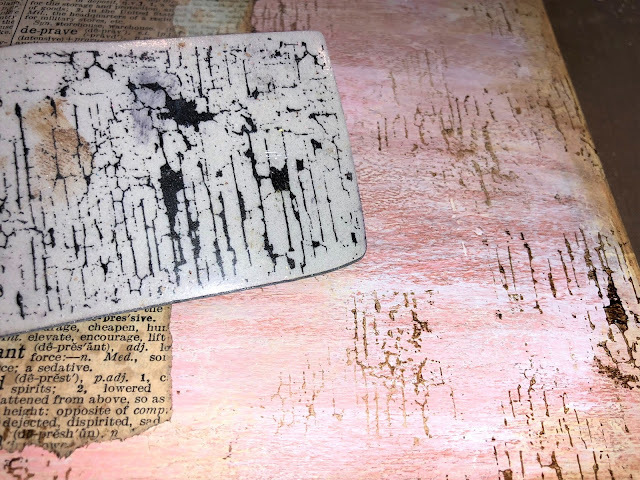 I sanded off some of the color, allowing the Burnt Umber underneath to peek through. 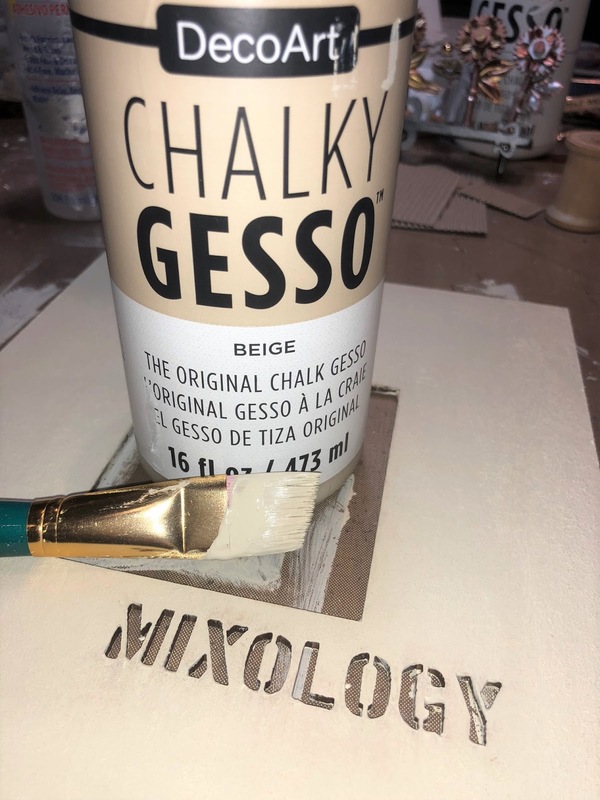 Then using my finger, I added touches of the Chalky Beige Gesso to blend the colors together even more. 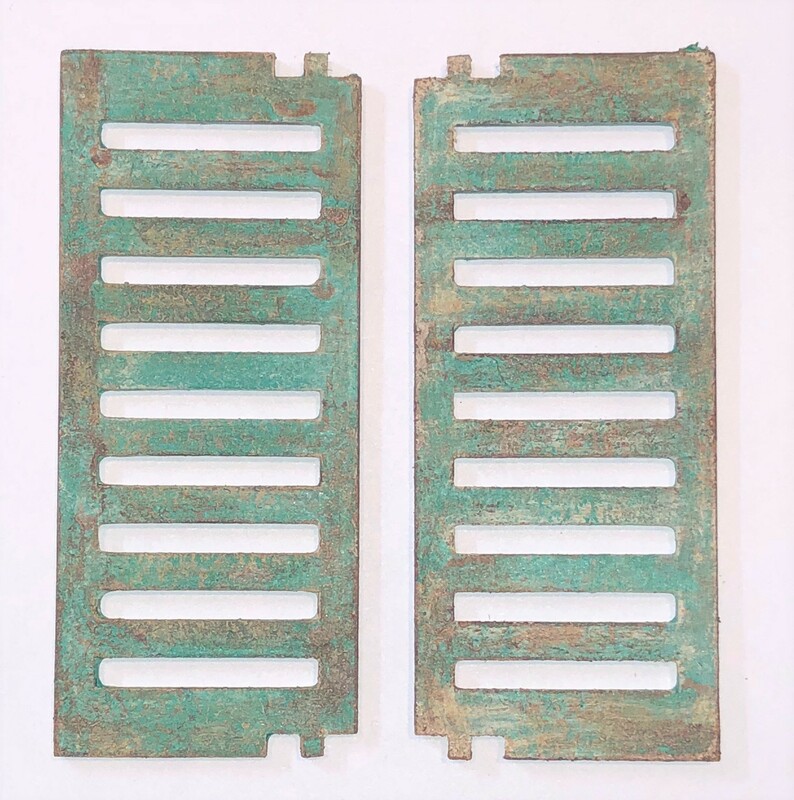 In this picture, you can also see the little prongs on the insides of the shutters that fit into little round attachments that allow them to swing once they are attached to the frame. Here is the genius contraption that fits behind the frame to allow the shutters to move. It also gives even more stability to the frame itself. I painted the contraption with the colors I used on the frame base. I used the pouncing method again to add more color to the frame base. I wanted this piece to resemble an old cracked stucco wall you might see in Europe. 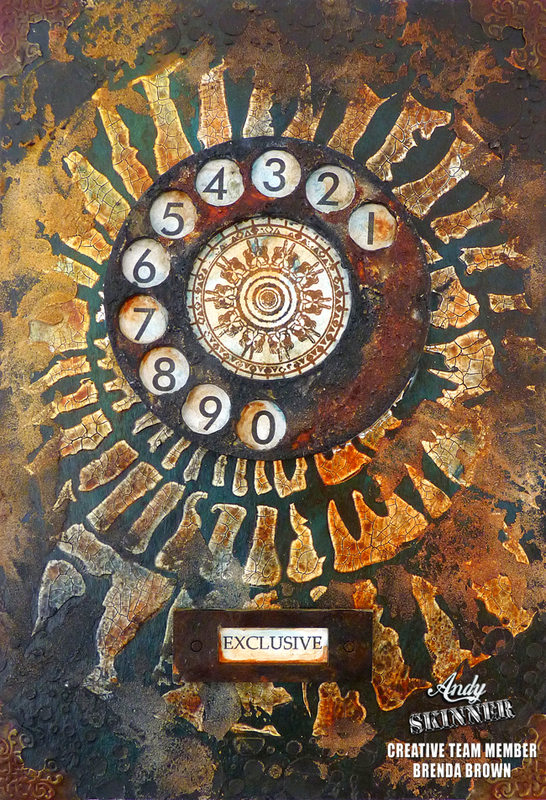 I pounced over the beige base with a combination of the beige gesso and DecoArt Media Fluid Acrylics Yellow Ochre. The brown in the cracks and shading around the edges of the frame is DecoArt Media Fluid Acrylics Burnt Umber. 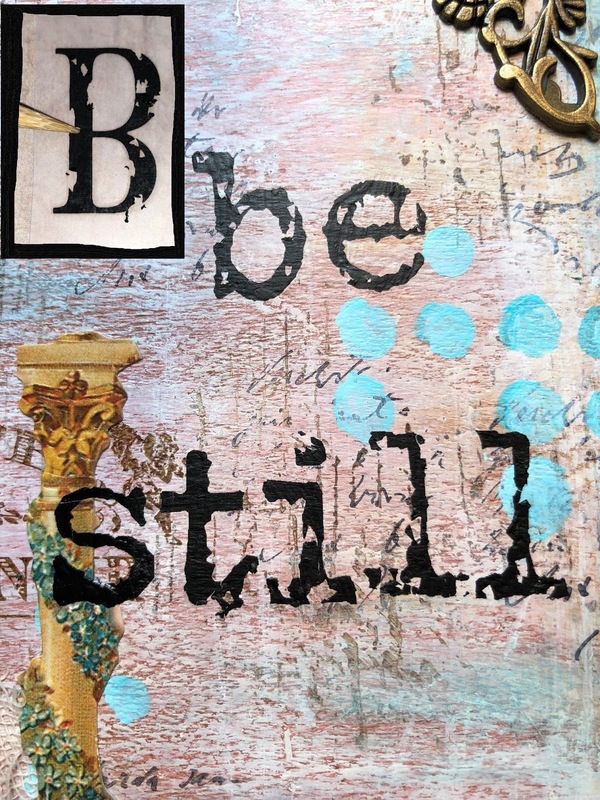 I added touches of the Chalky Beige Gesso over the cracks to blend them in with the background even more. Then I glued the shelf in place in the lower left corner. 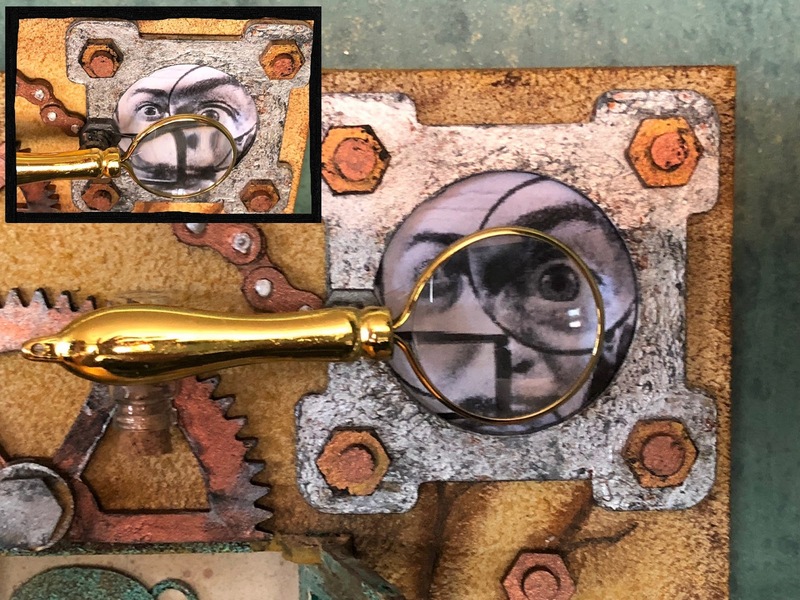 In the upper right corner, I added a photograph of Salvador Dali looking through a looking glass. I thought the suspended dimensional metal looking glass in front of the industrial pieces was fun. Here is another close up at some of the many elements on this frame. 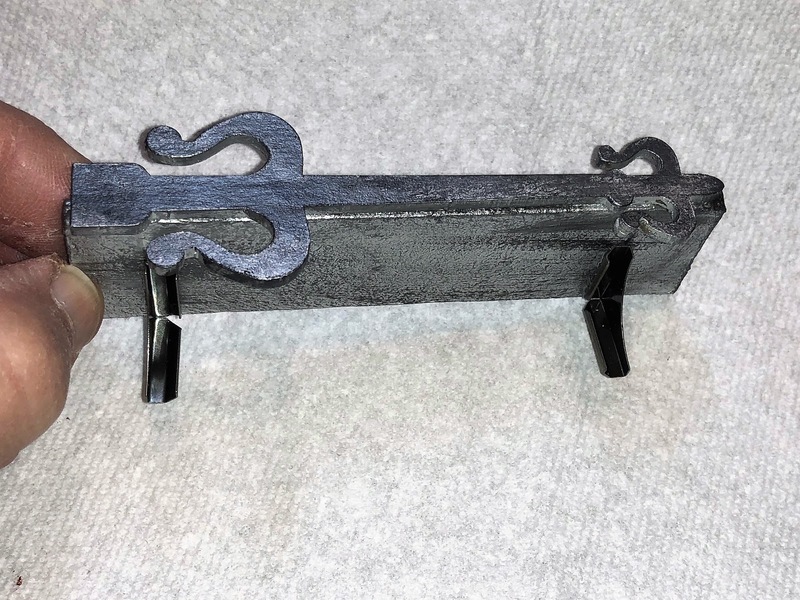 The "metal" grey board pieces work so perfectly with the real metal pieces. You will also see Andy's rusty wire winding it's way through a lot of these elements. The patina look on the weathered silver time face is embossing power that was added and heat set in place. 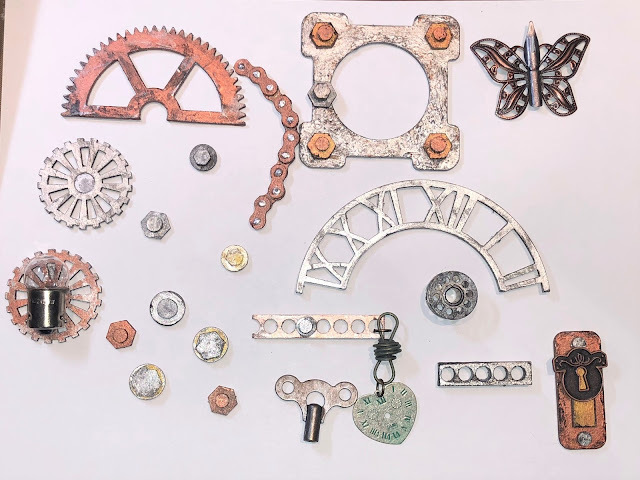 More of the elements of this kit combined with real metal pieces. 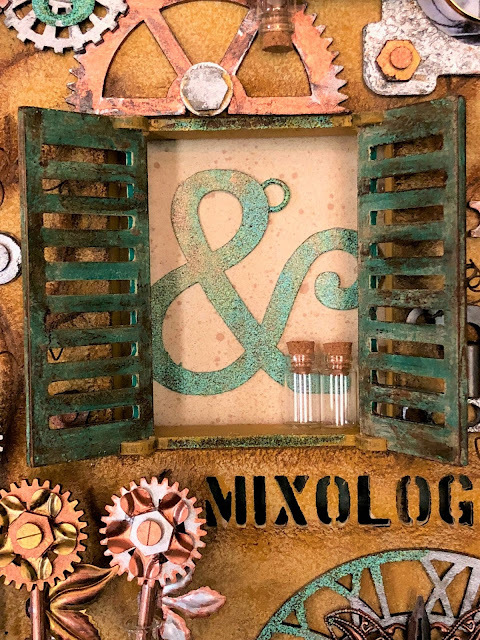 I stuck a large ampersand symbol that was heat embossed using a patina embossing powder in the center of the frame along with a couple of empty vials. You could easily insert a photograph in there and use this piece as an extravagant picture frame ... not another one like it in the world! 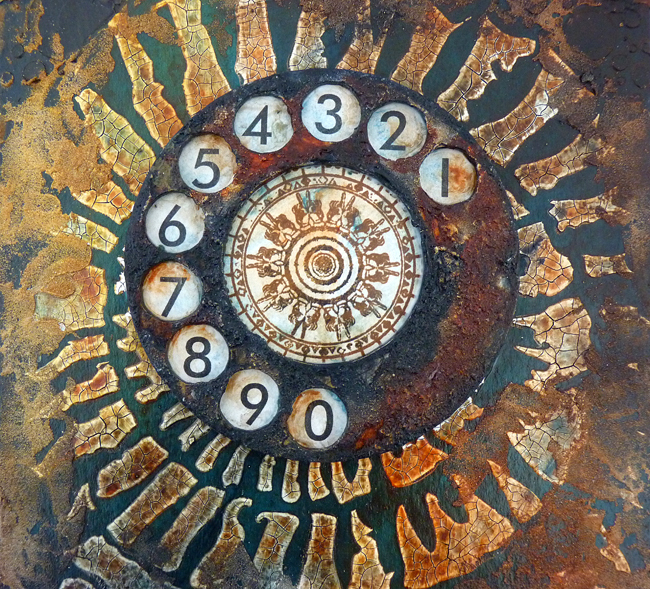 That is the beauty of mixed media. It truly is YOUR art, YOUR imagination and YOUR creativity coming to life! So many of us are going through things that no-one else can see. I love how the bulb looks like an eye from above. I have been using tape runners in my classes for a long time now and I was determined to find a way to use them in a project rather than just throw them away! The wire flower bent into a flower shape and pushed into the plastic roller that the tape used to wind around. I layered up some of Andy's elements to make a mechanical flower centre. The oval shaped area in the middle is an inner part of the runner. The flower at the bottom of the bulb is the bigger part of the roller mechanism....I heated it with a heat gun until it melted and folded into a flower shape, which was the perfect holder for the bulb! Scraps of lace and sequin on a roll were layered across the tag. I stamped and embossed some of the words from Andy's 'Word Up' set, stuck the words inside paperclips and added them to more twisted wire. 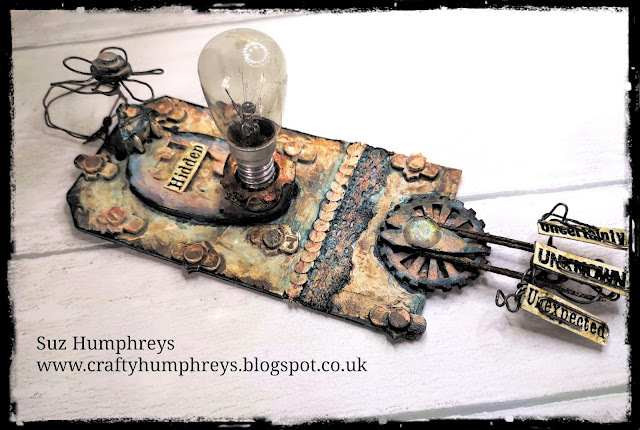 For more details and steps, have a look at my blog https://craftyhumphreys.blogspot.com/. DecoArt: White gesso, Decoupage Glue, Media Fluid Acrylics; Titan Buff, Prussian Blue, Quinacridone Gold, Raw Umber, Rusty Wire, paper clips, lace, sequin on a roll, elements from the Andy's kits. I have a problem!!!! I seem to make endless projects for design teams and for myself but many of them are sitting in boxes as I just don't have enough room to display things. So my projet today is on a 22 1/2 x 15 1/2 cm piece of greyboard which I am going to use as a book cover and make more projects in the future that can be put together with this as a book. 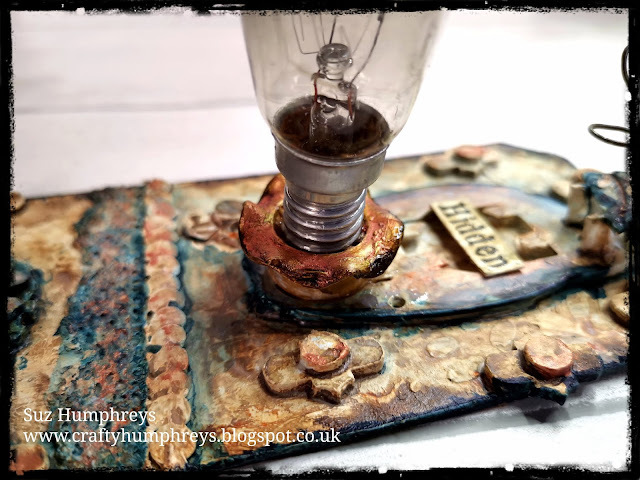 Whilst making this I was inspired by Teamie Hannah's FaceBook live video on creating rust and I followed along when rusting the telephone dial. 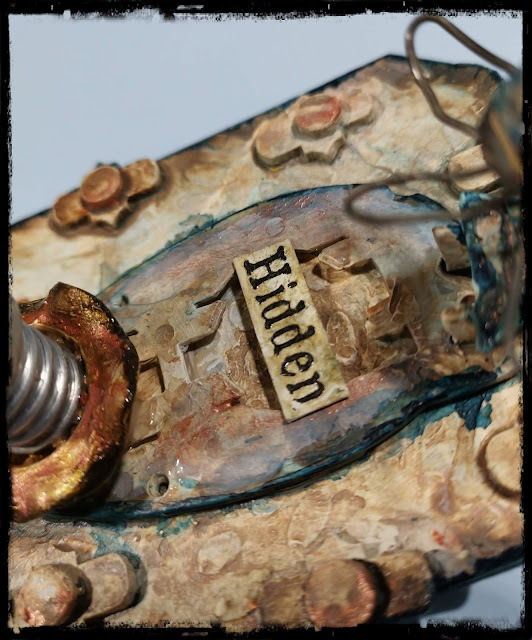 The little bookplate was in a tub already rusted and it fitted perfectly with the word I had found to use. 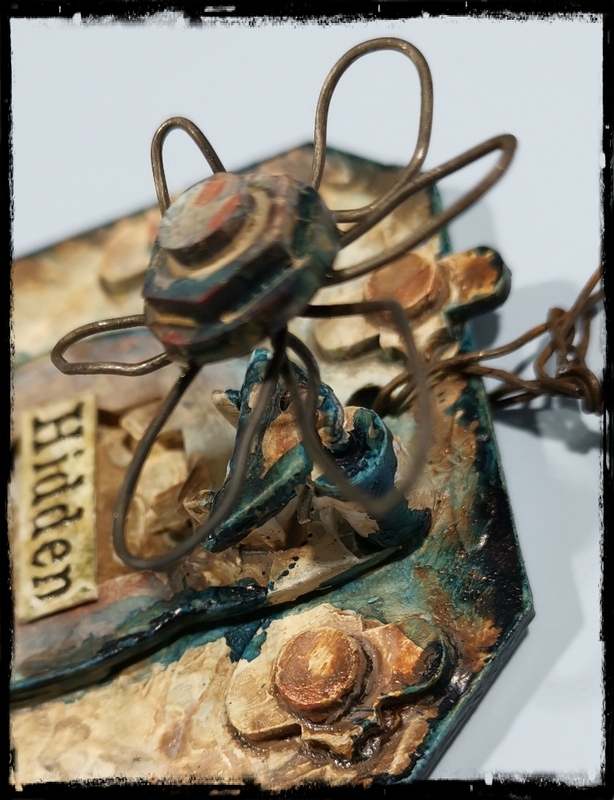 You can also see some of the texture I added to get this good grungy look. 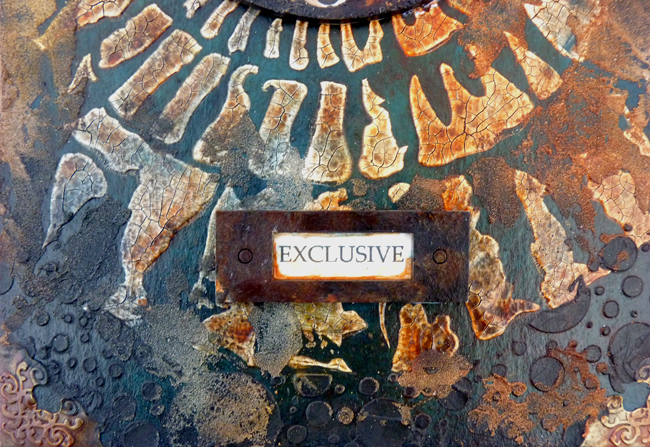 Sometimes less embellishing is so eye catching and it lets the design in the background show through more. There are some process steps and more photos over at Bumblebees and Butterflies if you're interested in seeing how this came together. DecoArt media fluid acrylics - phthalo green-blue, prussian blue hue, cerulean blue, titan buff, paynes grey, silver metallic, yellow oxide. metallic gold, quinacridone gold, burnt umber, transparent yellow oxide. The birds know it and I can hear them singing outside even though the skies are grey and the wind chill is ridiculously cold at the moment. I am anticipating the warmth and sunshine of Spring and it is invading all of my creative thoughts these days. Thus, I created this lovely shabby chic vintage style wooden suitcase. DecoArt is releasing a new product called Chalky Gesso. It comes in several colors including White and Beige. I chose White Chalky Gesso as the basecoat on my wooden suitcase. This Chalky Gesso is amazing! 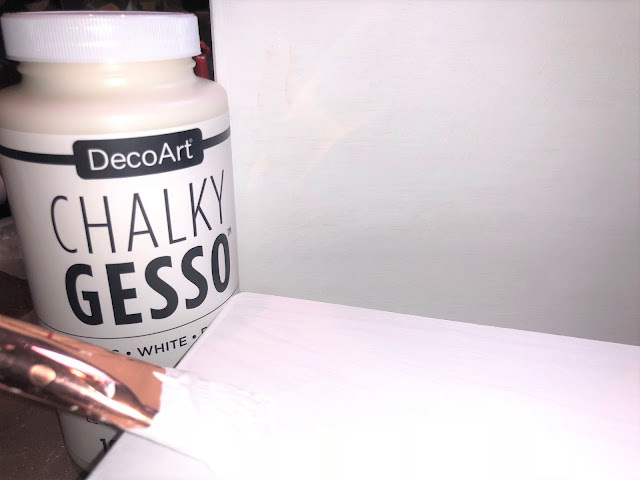 It is a cross between Gesso and Paint; thinner than gesso but thicker than paint. 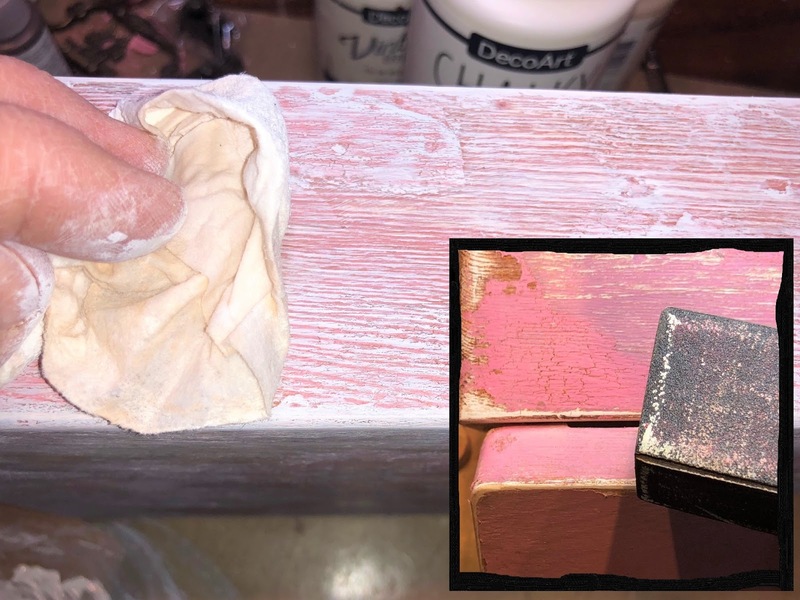 It goes on smoothly and doesn't leave a lot of brush strokes or a need to sand. 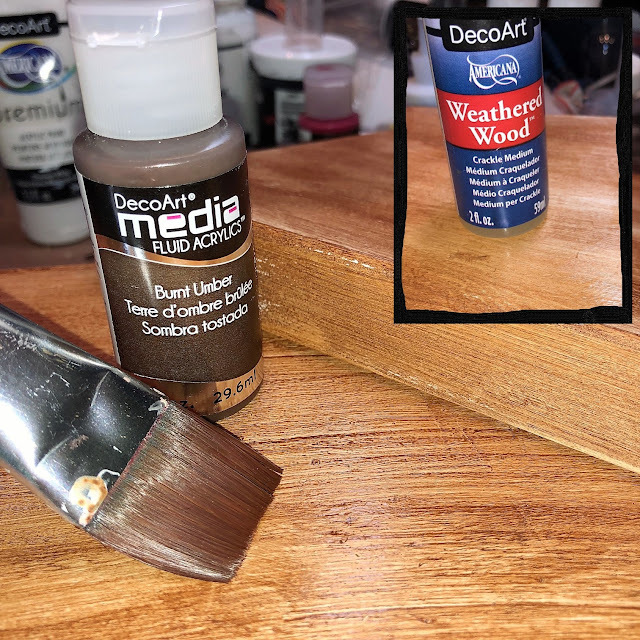 It works on all sorts of surfaces: wood, metal, paper and the results I have had with it are amazing! 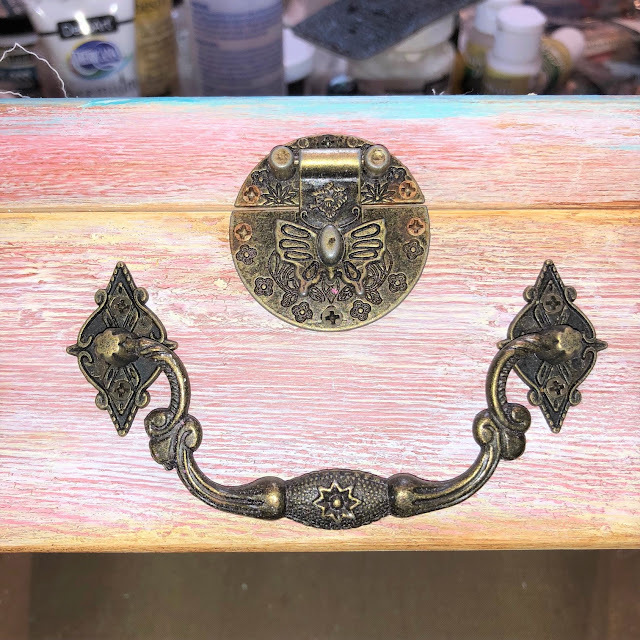 First I removed all of the inexpensive bright fake silver "metallic" hardware and replaced it with my own antique bronze hardware at the end. Where I had removed the hardware, I used wood putty to fill the holes and then I sanded everything down to create a smooth surface. 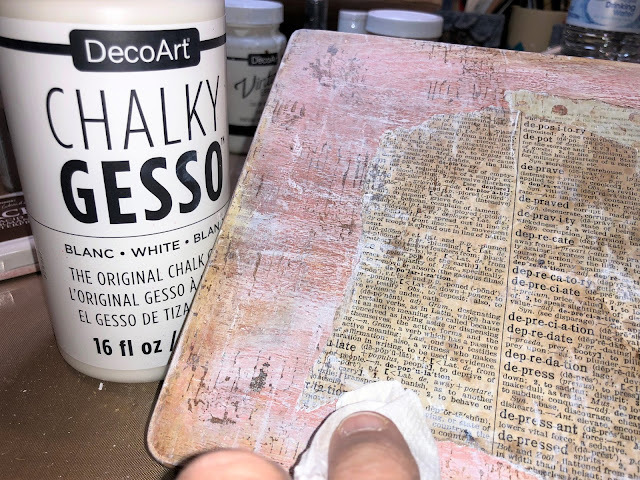 Next I brushed the DecoArt White Chalky Gesso over the entire suitcase and let it dry. Then I lightly sanded again to get a really smooth finish. 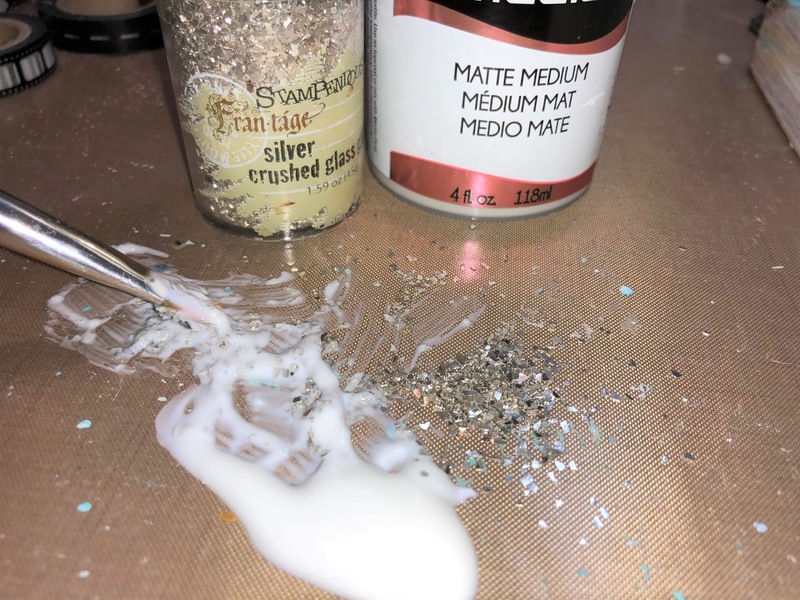 I wanted a darker color basecoat as I intended to crackle the surface. So a coat of DecoArt Media Fluid Acrylics Burnt Umber was applied followed by a generous coat of DecoArt Weathered Wood. Let the Weathered Wood air dry so that the crackling will work correctly. This petite suitcase was screaming "PINK!" for the top color. So I mixed DecoArt Fluid Acrylics Quinacridone Red and Titan Buff to create a soft pink that I then brushed over all of the exterior and the interior walls and edges of the suitcase. It did not take long at all for the crackling effect to begin. Let the paint air dry. I did some sanding around the edges and randomly on the surface to scuff up the suitcase and give it a real weathered, worn, vintage look. 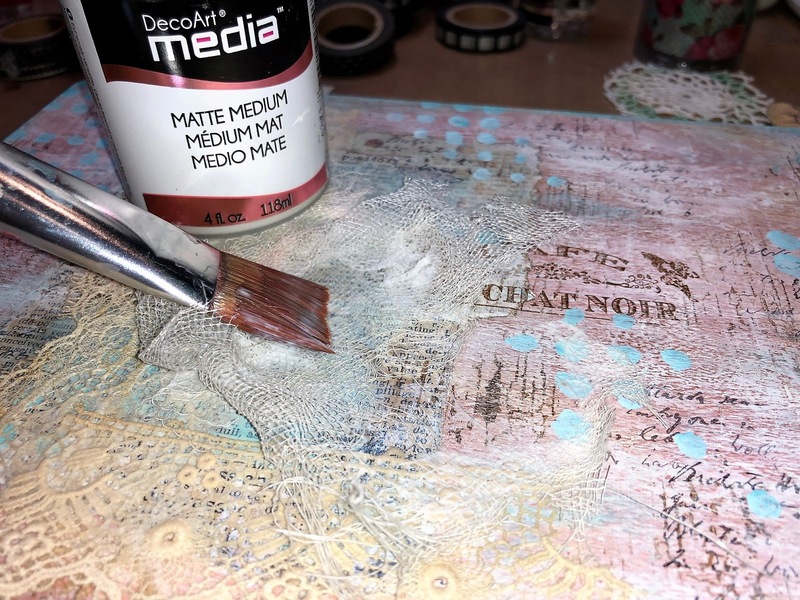 I then poured more DecoArt Chalky White Gesso onto my craft mat and randomly wiped it onto the surface of the suitcase to tone down the pink and allow the wood grain, crackling and texture to really be revealed. 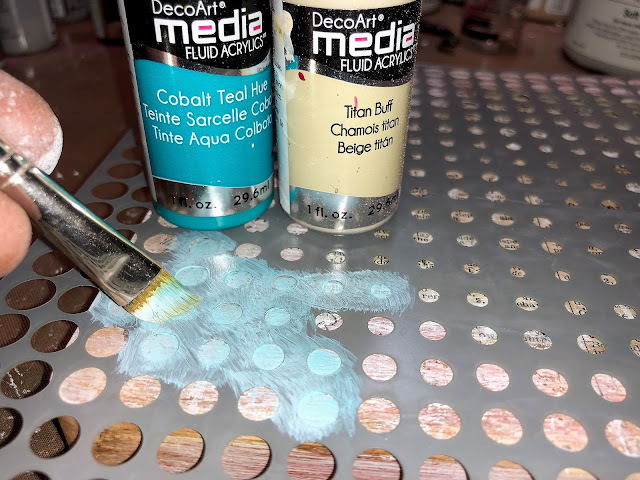 DecoArt Media Matte Medium is an excellent glue and sealer. It dries clear and quickly. I added some cardstock and dictionary torn scrap onto the top of the suitcase and brushed Matte Medium under it and over it to seal it. You can heat set this. 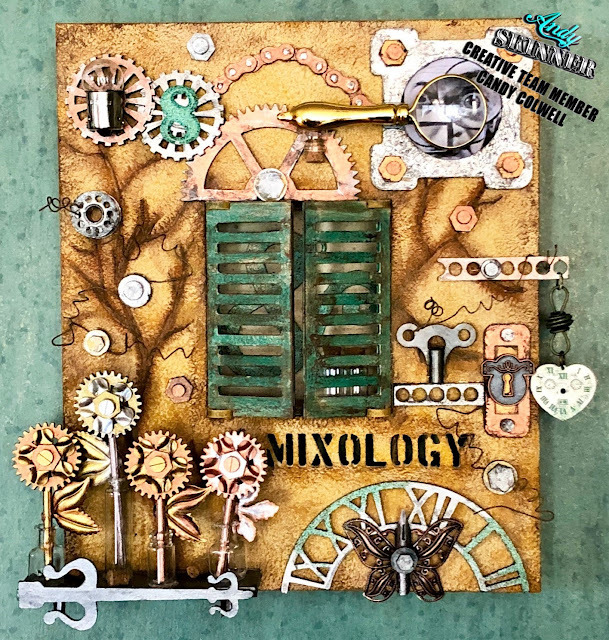 One of my favorite Andy Skinner Stamp sets is Industrial because I love all three of the background texture stamps. I stamped this one in a darker brown permanent ink randomly on the top of the suitcase. 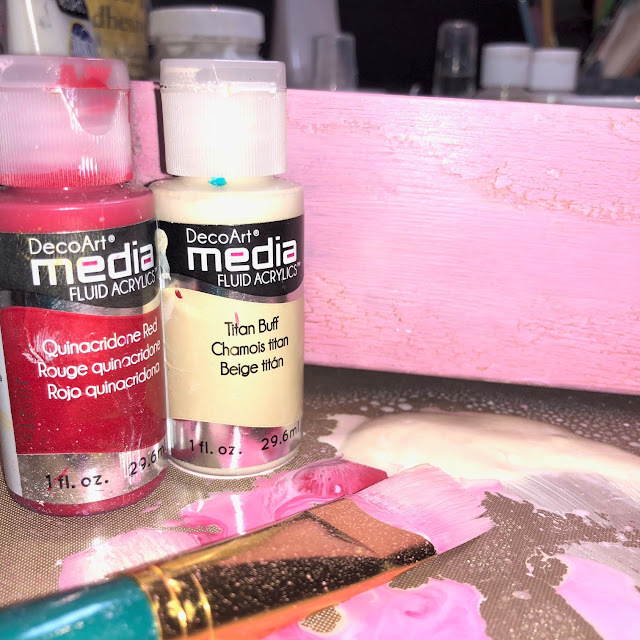 Then I added a little bit of water to some DecoArt Media Fluid Acrylics Burnt Umber, dipped my fingertip into the paint wash and rubbed it along the edges of the suitcase; blending it into the pinkish tones of the suitcase basecoat. This defined the edges as well as added more of an aged appearance. I then added a few more white highlights using the DecoArt Chalky Gesso and a baby wipe and randomly adding it to the top of the suitcase. 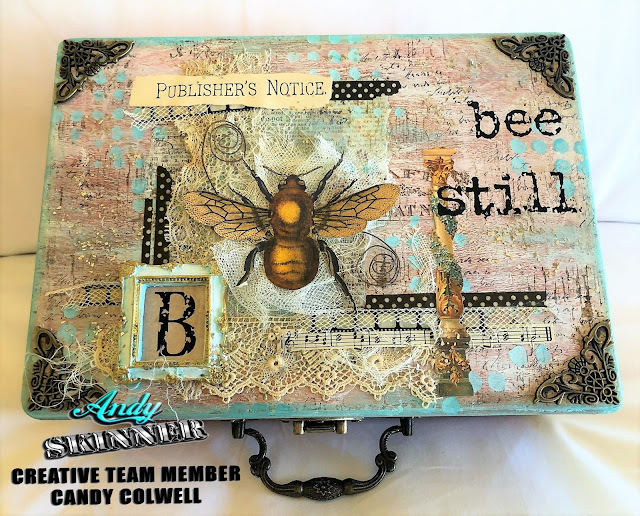 The next layer on the top of the suitcase was added with more stamps from more of my favorite Andy Skinner stamp sets; Shabby Chic and Textures. 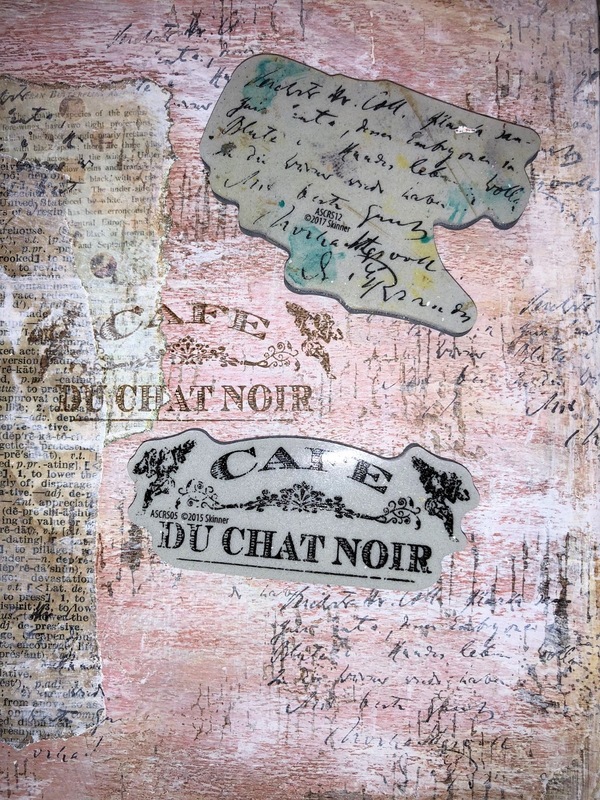 I stamped the cafe stamp in the dark brown permanent ink. The script stamp was stamped with a combination of black and dark brown ink. Color! Color! Now we need a POP of color! 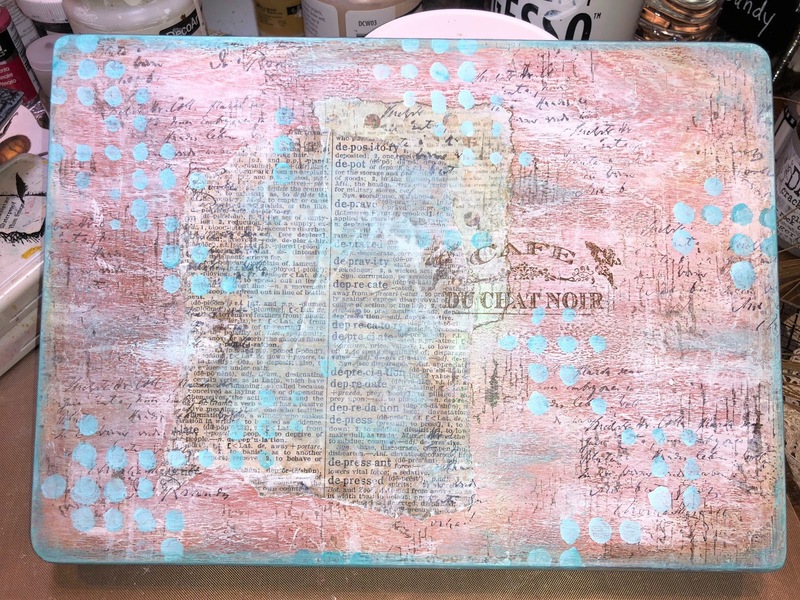 I mixed DecoArt Media Fluid Acrylics Cobalt Teal Hue and Titan Buff to create a soft teal color and stenciled it randomly onto the top of the suitcase through Andy Skinner's DecoArt Halftone Stencil. I then used this paint to edge the suitcase top using my finger just as I had done with the Burnt Umber Paint wash. The teal pulls everything together. It frames the top of the suitcase, give a real "upmf" to the top and provides the perfect contrast for the embellishments that I will now add to the top. Time for the fabulous Matter Medium again! I added some antique lace, washi tape, German Scrap, a big cut out bee (I had found while surfing the internet), paper scraps, scrunched up cheese cloth, and even some of Andy's Rusted Wire underneath the bee. All were held in place using Matte Medium! I had a little plaster frame in my stash of stuff. I painted it with DecoArt Media Fluid Acrylics Cobalt Teal Hue followed some light wiping of DecoArt Chalky White Gesso to soften the color. 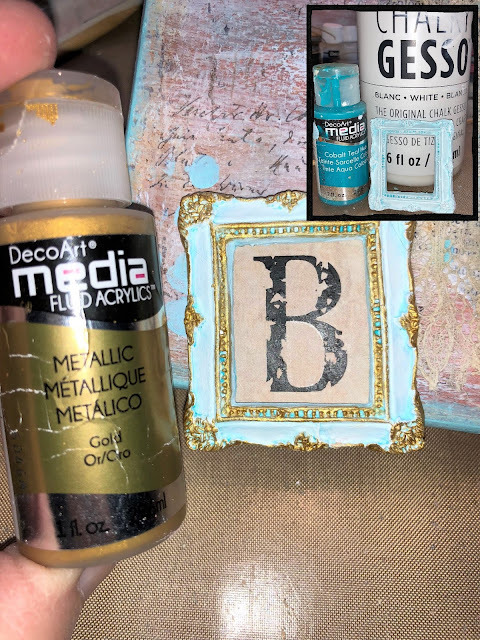 Next, using my finger I highlighted the raised areas of the frame using my finger to apply little touches of the DecoArt Metallic Gold Paint. Then I added the rub on "B" to the frame and this embellishment was ready to put in place. Just as I had done with the "B", I altered the appearance of the rub on letters by scratching some of the black lettering off. This makes the letters look even more worn and really does change their appearance. I love this technique! 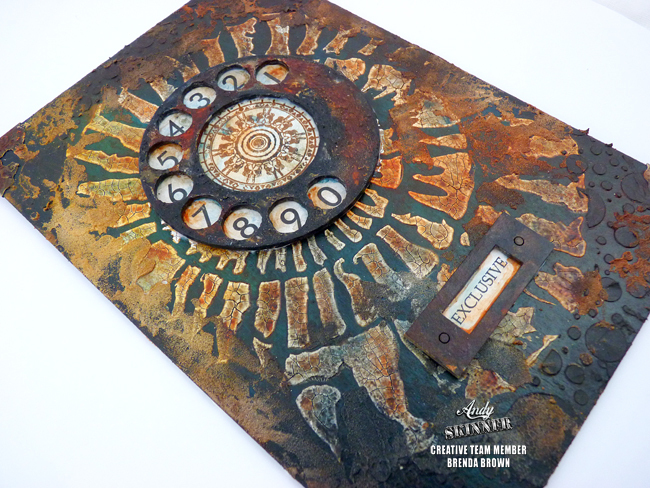 I applied antique bronze metal corners to the top of the suitcase using DecoArt Media Matte Medium. I've seen crushed glass in some mediums you can buy. It's expensive. So I decided to try mixing some Silver Crushed Glass with some Matte Medium and brush it onto a couple of places on my suitcase top to see if it would stay and be a neat way to add some subtle shimmer and light to the top. IT WORKED PERFECTLY! I wish the camera could catch the sparkle of the Crushed Glass better but trust me, when the sun catches it, it's awesome! Here is the hardware that I installed in place of the original fake silver "metallic" hardware. This is so much more vintage looking and gives a wonderful, warm shabby chic vibe. The interior was finished off much in the same was as the basic exterior. Then I added appropriate card stock to the bottom and top of the suitcase. 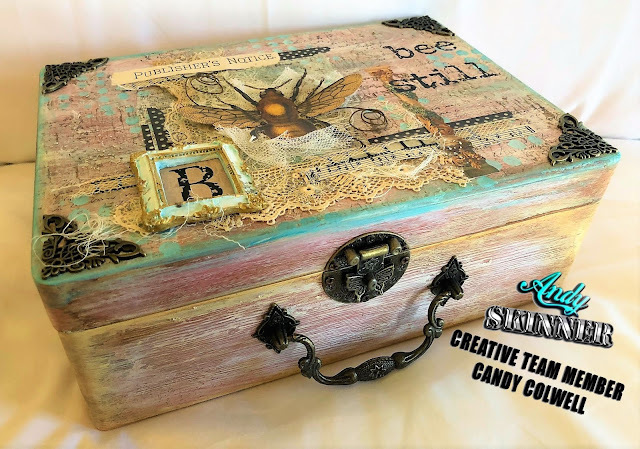 This project was so much fun to transform from a plain little wooden suitcase into something beautiful and fun and worth to hold lovely little vintage laces, handkerchiefs or other prized trinkets.